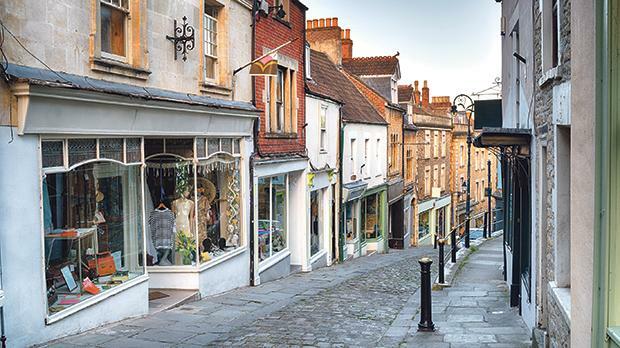 The old market town of Bruton in Somerset, like the nearby town of Frome, is self-consciously cool. The epitome of the Baking Age and craze. Its sourdough baking heritage is a little too self-promoting, a little hard to swallow. Maybe, it’s not for the stoneground organic flour-intolerant. All the artisanal sourdough can get in your face. You can’t seem to turn a corner of one of the old ‘bartons’ or ancient steep alleyways down to or from the river Brue without smelling wholemeal organic spelt rising to the occasion and rosemary and sea salt crisping and crusting in a wood-fired oven. Bruton might be called a bit ‘luvvie’. It is certainly popular with ‘twats’. Or former ones. Caroline Kitchiner, a philosophy graduate of Exeter University born on a pig farm and now a builder project manager, lives in Discove Cottage in Bruton, 27 miles south of Bath, 38 west of Salisbury and 90 minutes on the train from London. Caroline and Luke Haughton, a furniture maker, live in novelist John Steinbeck’s former cottage, a mile outside of town down off Dropping Lane. Guests stay in three coastal redwood-clad shepherd’s huts in the garden. “I do the breakfast and Caroline does the beds,” says Yorkshire-born Luke, a Steinbeck fan. “It’s all local produce. Our strawberries are from Cheddar and milk and honey from down the road. We knew we wanted to live here forever before we even got inside. We decided halfway up the drive. It’s the only thing we’ve ever agreed on. Without an argument! Californian Steinbeck, author of Grapes of Wrath and East of Eden and 1962 Nobel Prize laureate, lived in Discove for six months in 1959, working on his Acts of Arthur and His Noble Knights, published unfinished and posthumously. The work was a long time in fermentation and Steinbeck put “long and arduous and expensive research” into something he eventually abandoned as “strange and different, but not bad”. He was obsessed by the Arthurian legend and loved Camelot Country, visiting Cadbury Castle and Creech Hill to “absorb the physical feeling of the places” where “voices came from the ground”. Cobbled streets at Catherine Hill in Frome, Somerset (also below). Says Luke: “The cottage hasn’t changed much since the 1950s. It was thatched then. And had a porch. Artist Betty Guy was commissioned by friends of the Steinbecks to paint it. Then it had no roses, hydrangea or vine climbing up the walls. Steinbeck didn’t have a rowing machine. Or a piano. As the cottage does now. He relaxed playing darts, scything the grass, cooking dandelions and whittling wooden spoons and making salad tongs! Steinbeck had one of the first fridges in the area. Steinbeck, who grew up in Salinas, California, wrote in the second-floor room overlooking the Big House which was once thought to be England’s longest thatched building. He called it the manor house. But it was more likely a dower (widow’s) house. The cottage, which is probably 17th century because of the pitch of its roof and was probably an estate gardener’s home, was found for the Steinbecks by Robert Bolt who wrote the screenplays for A Man For All Seasons, Lawrence of Arabia, Doctor Zhivago and Ryan’s Daughter. He taught English at nearby Millfield School. In gratitude he gave him a 14-volume edition English dictionary. Steinbeck, who wrote with ballpoint pens with goose quills stuck in the ends and a medieval medallion around his neck, used a local typist was the wife of a local schoolteacher. He was visited by local children studying his Of Mice And Men. Bruton’s museum – a former garage – contains his stand-up writing desk and letters posted from “right smack in the middle of Arthurian country”. As well as Roman coins, brooches, arrowheads, an AD800-900 sword and a mock-up of a 1950s hairdressing salon. Bruton’s museum – a former garage – contains Steinbeck’s self-designed stand -up writing desk and some letters. Mr Windmill ran the ironmongery shop. Elaine worked as a cleaner in the two-tower St Mary the Virgin church which serves Church of England and Roman Catholic congregations. Steinbeck loved visiting the long gone sheepskin factory. Bruton goes back to Saxon times. It boasts Jacobean almshouses, ‘burgage plots’ (narrow enclosed fields), a stepping stone ford, duckpond, 15th century packhorse bridge, 1789 dovecote which was part of an Augustinian abbey and Georgian-facaded high-street pharmacy as well as the more modern Hauser & Wirth Art Gallery. And gardens. And a red telephone kiosk called Rita. The other favourite son of Bruton – originally ‘Briuuetone’, meaning ‘vigorously flowing river’) is Hugh Sexey, Elizabeth 1’s auditor. He founded a hospital, now a home for the elderly. Actor Nicolas Cage has a cottage nearby. Sean Bean too. Steinbeck speaks of “the luxury of rest and peace”. Elaine said that Steinbeck “found something there”. 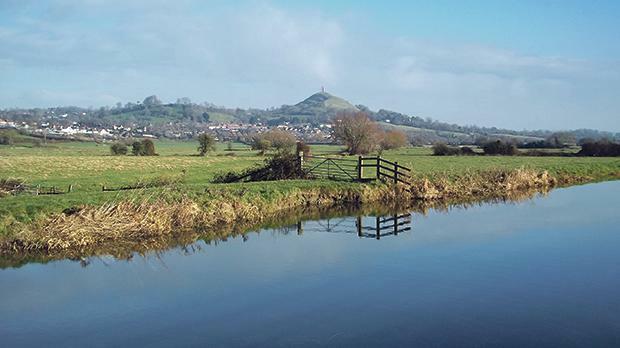 Glastonbury Tor from the River Brue in winter. As have Caroline and Luke, their two children and three dogs – Poppy the black labrador, worker collie Sam and half springer Tips. Says Luke who makes your early morning toast with his homemade bread : “I’m a Steinbeck fan. But love poetry too. Yeats Lake Isle of Innisfree sums it up for me. And soon we may be bee loud as we may be getting some bee hives.” The name refers to the River Brue, which flowed dramatically fast through this hill country, and often flooded the town. Follow any of the alleys which lead behind the houses, and you’ll see the now tamed and picturesque river winding through a deceptively deep valley in the heart of the town. 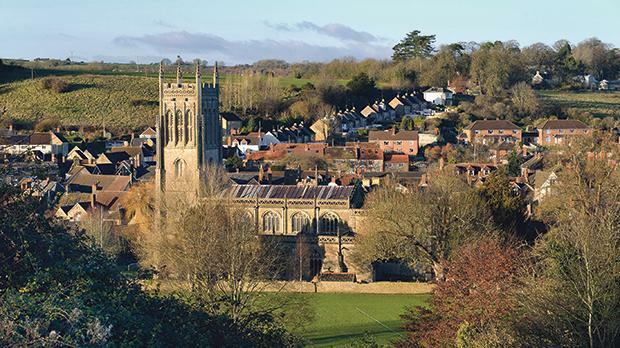 Steinbeck described the atmosphere at Discove where he could see nothing which wasn’t there in the sixth century: In medieval times Bruton Abbey was one of the great religious houses of Somerset, and the town owes its success to that. While the skyline of Glastonbury is dominated by the Tor, Bruton has its famous dovecote. 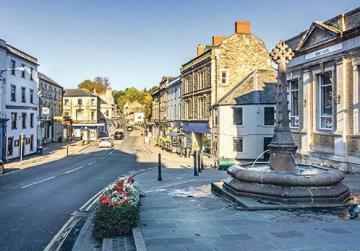 Built in the C16, catering for over 200 pigeons, and now managed by the National Trust, it’s visible from everywhere in the town on a neighbouring hilltop, and is the best place from which to view the town. Bruton is surprisingly cosmopolitan because it’s easily reached from London, by rail (Castle Cary station) and from the A303. As well as all the local artistic ventures, it now boasts the exciting new Hauser and Wirth gallery, ingeniously installed in a restored farm just outside the town, with constantly changing exhibitions. Apart from art, you could say that the main local industry is education. There are three highly regarded boarding schools within the town: Kings School, Sexey’s School, and Bruton School for Girls. The name refers to the River Brue, which flowed dramatically fast through this hill country, and often flooded the town. Follow any of the alleys which lead behind the houses, and you’ll see the now tamed and picturesque river winding through a deceptively deep valley in the heart of the town. In medieval times Bruton Abbey was one of the great religious houses of Somerset, and the town owes its success to that. While the skyline of Glastonbury is dominated by the Tor, Bruton has its famous dovecote. 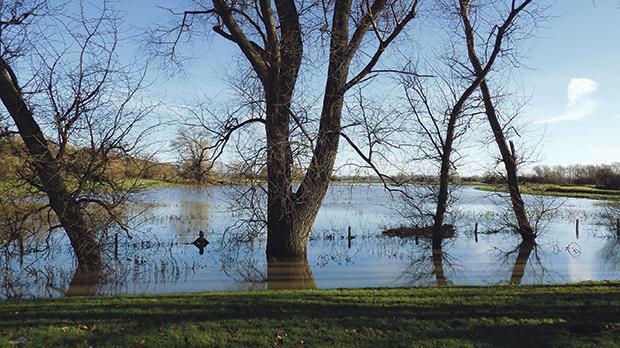 Winter trees in flooded fields by the River Brue. These, together with the narrow, closely built streets, give this tiny town a collegiate flavour.